With a proper release still months away, Wizards of the Coast surprised us today with a handful of early spoilers for Rivals of Ixalan, as well as further details about rewards for the upcoming Ixalan Store Championship event. Skip to the bottom of the page to just see today’s Rivals of Ixalan early spoiler cards. 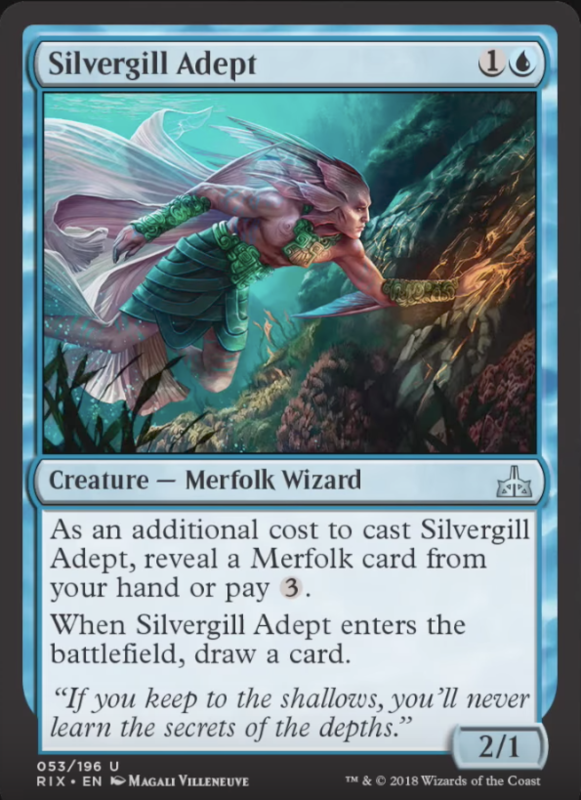 The first cards spoiled—two versions of upcoming Lorwyn reprint Silvergill Adept—come via a Tolarian Community College video promoting Magic Open House event. Attendees will receive a special full-art promo copy of the card. Magic Open House events are held at local game stores, corresponding with each new set release. The aim of this free event is to introduce new or returning players to the game with special starter decks. The next Magic Open House will take place January 6-7, 2018. Watch the Professor’s video below. The second spoiler of the day was shown via a post on magic.wizards.com by Blake Rasmussen, outlining rewards for the upcoming Ixalan Store Championship. 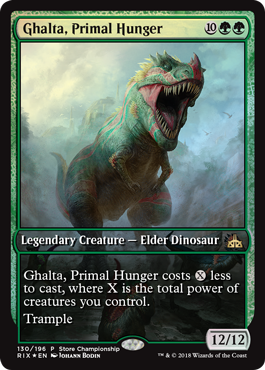 Participants of the championship will each receive a full-art promo copy of Ghalta, Primal Hunger, a massive “Elder Dinosaur” creature from Rivals of Ixalan. 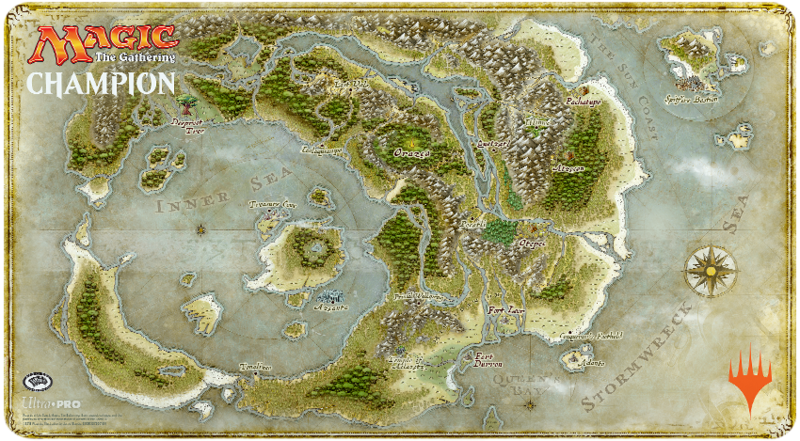 Players in the top 8 of each event will be rewarded with deck boxes featuring new art from the upcoming set, with the winner taking home the grand prize in the form of a special playmat featuring the map of Ixalan design (see above). While not explicitly mentioned in the January announcement, local game stores are now also allowed to offer Draft or Sealed instead of Standard. These changes come as Wizards appears to be putting greater focus on Limited play. Further, moving this event to the end of the season allows Wizards to promote the upcoming set, and could work to keep players interested for longer. Ixalan Store Championship events will take place December 25-31, 2017. Check with your local game store for participation. Rivals of Ixalan releases January 19, 2018. Rivals of Ixalan early spoiler reveals can be found below. 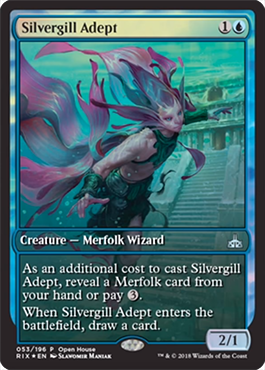 As an additional cost to cast ~, reveal a Merfolk card from your hand or pay 3. ~costs X less to cast, where X is the total power of creatures you control.